“Wine & Wig is a charity event that isn’t actually about a charity, it’s about a cause—the cause of finding a cure for breast cancer and supporting local women with research, diagnostic, treatment and emotional support." -Kasie Smith, publisher, West Michigan Woman magazine. 1 in 8 of West Michigan Woman's readers will be diagnosed with breast cancer in the next year. 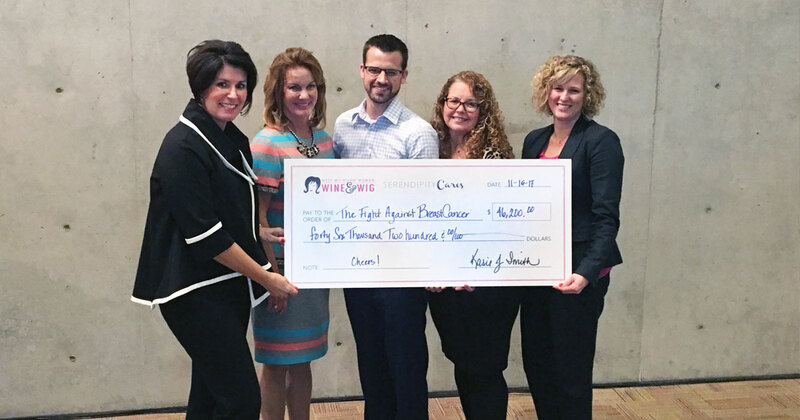 Wine & Wig's mission is to fund local charities to help fight breast cancer in our community and to educate our audience about each charity and their resources. We're lucky to live in a community where organizations and resources are bountiful for those fighting breast cancer. What we realized, though, is that there exists some confusion about the mission of these organizations and how they differ. No other event brings these four charities together—making Wine & Wig the perfect and only opportunity to draw attention to all the local breast cancer organizations and resources in one place. Four local cancer charities and West Michigan Woman Magazine have joined forces to find a cure for breast cancer and support local women with research, diagnostic, treatment, and emotional support. All event proceeds will benefit Komen Michigan, the American Cancer Society, Gilda's Club Grand Rapids, and the Van Andel Institute. Komen Michigan is an independent, local nonprofit organization that is dedicated to combating breast cancer. Seventy-five percent of the organization's net proceeds go toward programs and funding grants to local hospitals and community organizations that provide breast health education, screenings, diagnostics, and survivorship programs for underserved men and women in Michigan. The remaining twenty-five percent funds global, leading-edge research focused on the prevention of, and cures for, breast cancer. Komen Michigan's mission is to save lives and end breast cancer forever by empowering people, ensuring quality of care for all, and energizing science to find the cures. For more information call 616.752.8262 or visit www.komenmichigan.org. As the largest voluntary health organization in the United States, the American Cancer Society is committed to saving lives and finishing the fight against cancer. We combine our relentless passion with the wisdom of over a century of experience to make this vision a reality, and we get results. Thanks in part to our contributions, more than 1.5 million lives have been saved in the U.S. in the past two decades. The Society relies on the strength of approximately 2.5 million dedicated volunteers. Supported by professional staff, Society volunteers drive every part of our mission, helping people stay well and get well, by finding cures, and by fighting back. Stay well: We help people take steps to prevent cancer or find it at its earliest, most treatable stage. Get well: We're available around the clock to help people through every step of their cancer experience. Find cures: We fund and conduct research that helps us better understand, prevent, and find cures for cancer. Fight back: We work with lawmakers to pass laws to defeat cancer and rally communities worldwide to join the fight. For more information, we are available 24/7 at 800.227.2345 or visit www.cancer.org. Gilda's Club Grand Rapids provides free emotional healthcare to children, adults, families, and friends on any kind of cancer journey or those grieving the death of someone in their life due to any cause. The comprehensive program, delivered by licensed healthcare professionals includes education, structured sharing times, networking, lectures, workshops and social activities. Gilda's Club Grand Rapids is one of the largest and busiest of the fifty affiliates in North America. Each Gilda's Club and affiliate is independently owned and operated, with all funds staying local. The organization runs entirely on charitable donations, and currently serves more than 10,000 individuals each year at its clubhouses in Grand Rapids and Lowell, Michigan, in various schools and in community centers. For more information, visit www.gildasclubgr.org. Van Andel Institute (VAI) is an independent biomedical research and science education organization in committed to improving the health and enhancing the lives of current and future generations. Established by Jay and Betty Van Andel in 1996 in Grand Rapids, Michigan, VAI has grown into a premiere research and educational institution that supports the work of more than 360 scientists, educators and staff. Visit www.vai.org to learn more.